Infraglo manufacture and assemble highly efficient infrared radiant gas fired burners suitable for both the OEM and replacement markets. The gas burners can be fitted in a wide range of proprietory including process drying, heating and product finishing equipment. The British made infrared burners are designed and constructed to operate on all families of gases and will operate at all gas pressures. They are therefore suitable whatever the gas pressure and in whichever position you wish to fire the burner. - We guarantee it will work! They are lightweight and easy to handle and install and are constructed of special cold rolled steel. Then they are coated in a veneer of glass by a high temperature vitreous enamelling process to enable them to withstand intense heat. Supersaver gas burners are fitted with a recuperative gauze to give the same plaque temperature, and the same heat output, with 25% less gas than standard burners. Constructing gas burners from metal fibre instead of ceramic opens up a whole new world of custom shapes and sizes as well as giving greater resistance to both thermal and mechanical shock. Our flexible manufacturing operation means we can supply custom made burners, to your specification. Metal fibre burners can be produced in an almost unlimited range of 3D shapes and sizes. We have large supplies of ceramic plaques available from stock. 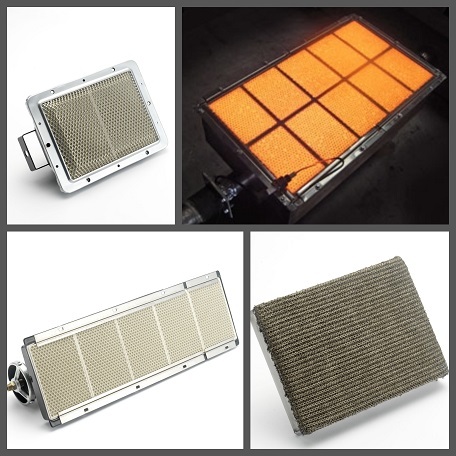 Replacement burners are available for all heaters.